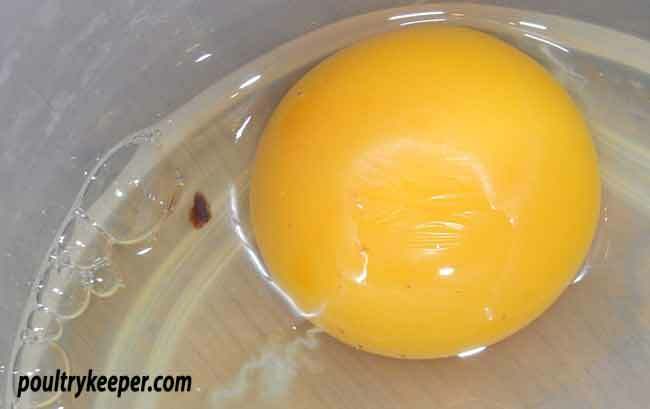 Meat spots in eggs are usually found in the albumen (white) rather than near the yolk like blood spots. They are brown in colour and are made up of small pieces of body tissue, from the lining of the oviduct. Meat spots appear more in older hens or hens with poor health but also vary according to the breed and the strain of the bird. They are more common in chickens than other poultry. Meat spots are not particularly appealing when cooking eggs but fortunately they can be removed easily using a table spoon and a teaspoon. Place the table spoon underneath the edge of the meat spot and scrape it off the egg using the tea spoon.